Thanks to Jessie Hurley, owner of Cherish the Thought for sponsoring this cruise. Jessie put in so much effort with her classes, and putting together the goody bags, and sending out information emails and contacting sponsors for the group. In addition, it is a huge obstacle to be away from one's business for two weeks. 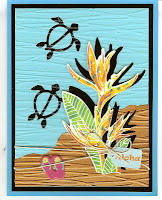 Jessie did this for our group. Yay Jessie! Thanks to all the generous companies and individuals (I see cute leather red flowers) who donated prizes for the goody bags and class prizes. Everyone won a prize...Yoohoo! 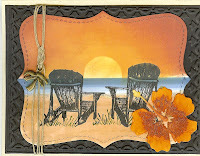 Thanks to all of the Sailing with Scissors members and their non-stamping companions for joining our group. I know friendships were formed on this cruise and that is definitely priceless. Thanks to our wonderful travel agent, Donna Athey who kept us organized, made cute change purses for prizes, and had a nice surprise for us when we started the cruise. Thank you as well to Don and Cheryl Adams, the owners of CruiseshipCenters, Donna's agency who provided the fun Carnival Make-n-Take prizes for our group. 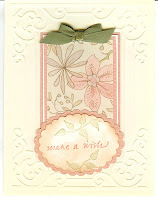 Thank you to Gail Matsuba, who did a wonderful card class for the participants. The cards were awesome. Also, a big thanks for organizing our shopping trip to J's Knicknacks. 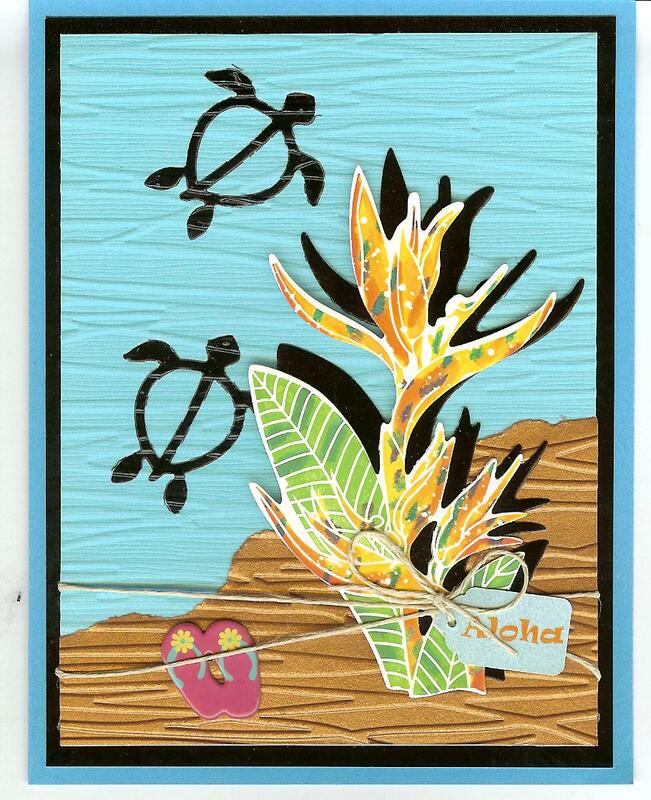 Thank you to the staff of Island Paperie in Maui, J's Knicknacks in Waikiki and Taj Clubhouse in Honolulu for the discounts and specials offered to our group. We really enjoyed the Make N' Take at J's Knicknacks. Thank you to our wonderful dinner staff, cabin stewards and other helpful Carnival Cruise staff. Personally, I would like to thank all the wonderful people in the Sailing with Scissors group, from the bottom of my heart. You were all so accommodating of my little sidekick. She had good days and bad days and you were all great. I couldn't have done it without you. Also, I received really positive feedback from all of you regarding the newsletters, make-n-take, and this blog. 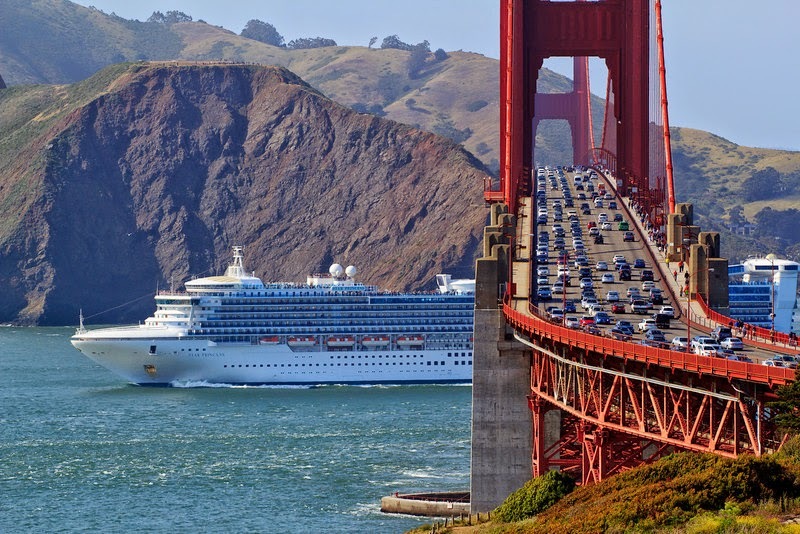 I am blessed to have met the new members in the group, and to re-connect with the people who joined us on the previous cruise. Just a quick note, Jessie has emailed all of us the password to enter the Sailing the Scissors photobucket account. When you get a chance, please copy your pictures to the account. This is beneficial to you because your pictures will be safe on the site. Also, if you missed taking a special picture, please review the files to see if someone else didn't miss that opportunity. If you didn't get the email, please contact Jessie. The cards from the card swap were awesome. I'm afraid my scanner doesn't do them justice. Thanks to all the participants. This time I remembered not to give any of the cards away, before I scanned them. 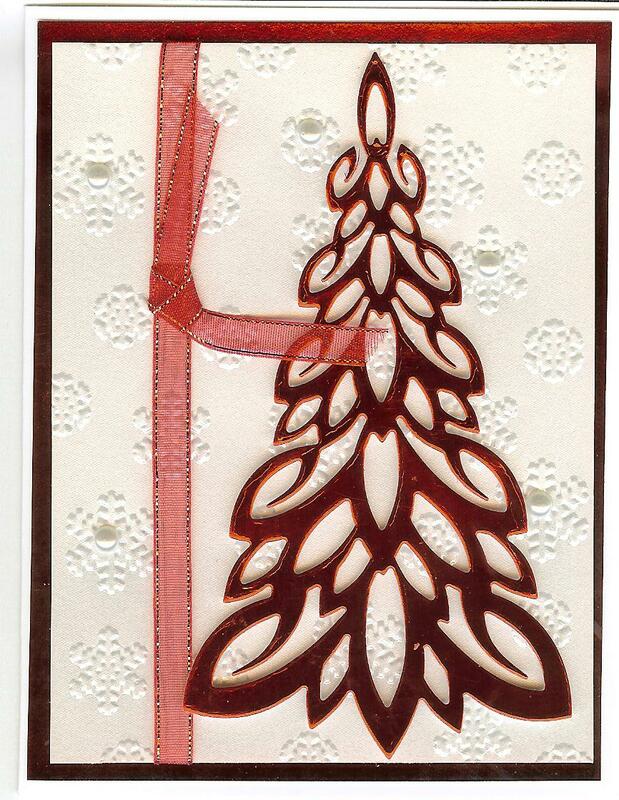 Classy, sparkly, gold embossed card by Trish. 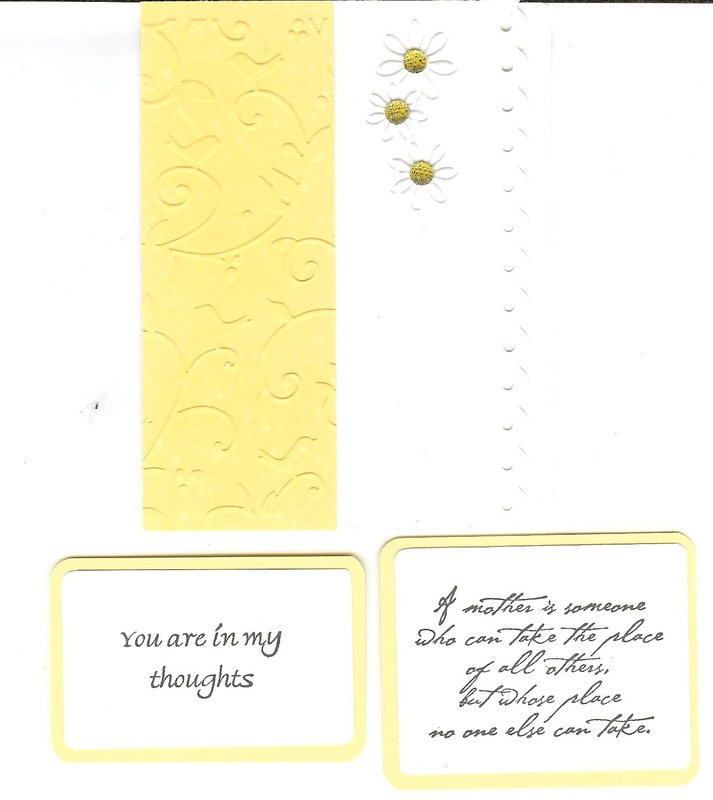 Also, Trish included an optional salutation for the inside of the card. Good idea. Shelley shaded perfectly the sunset on this tropical and warm feeling card. I love the charm attached to the braided cord. Fabulous. 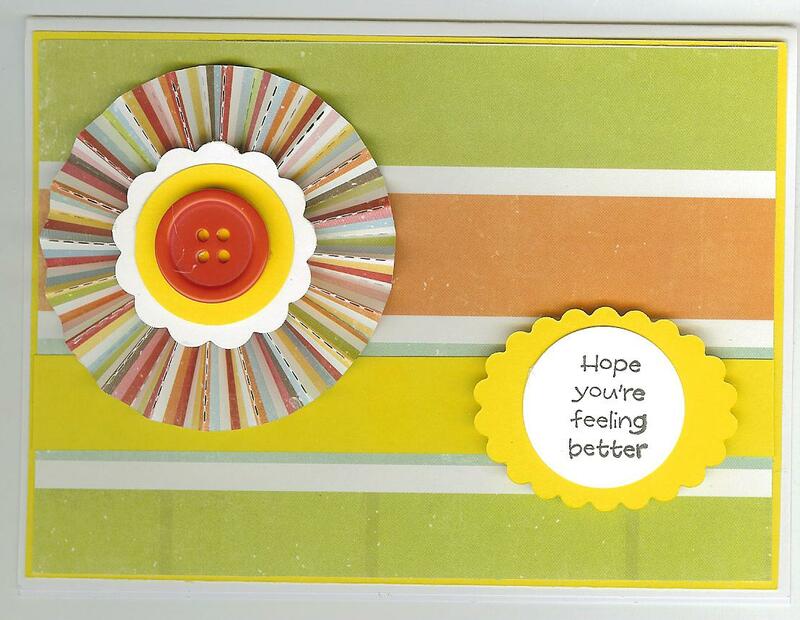 This is a very cheery get well card. The colours are warm and the design is eye pleasing. I'm afraid I don't have any information who did this card. You did a really nice job. I remember choosing this yellow card over the same card in green. Both were awesome cards. The little beveled flower centers are very cool. Awesome card. Oh no! I also don't have any information on who did this card. 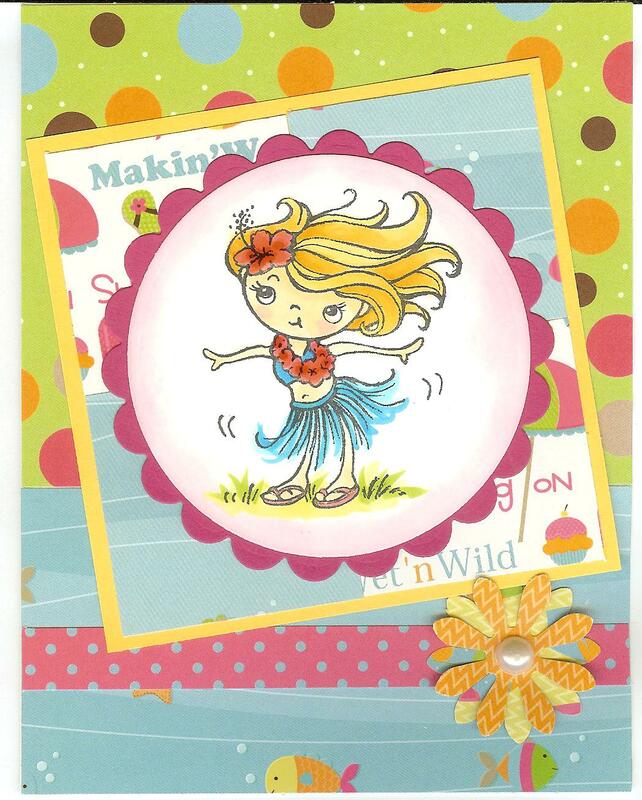 I like the fact that this card maker included two optional sayings for the inside of the card. I am loving this idea. 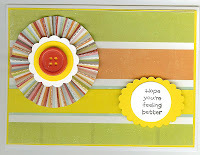 Barb did really nice work on this versatile card. The cameo is such a nice accent. Sweet. 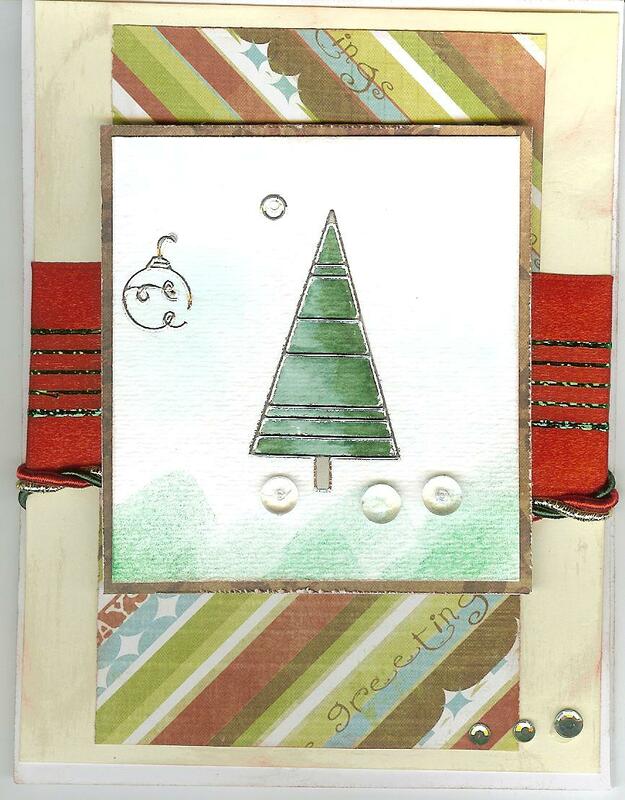 Linda used chalks to colour this dainty little card (and the envelope). 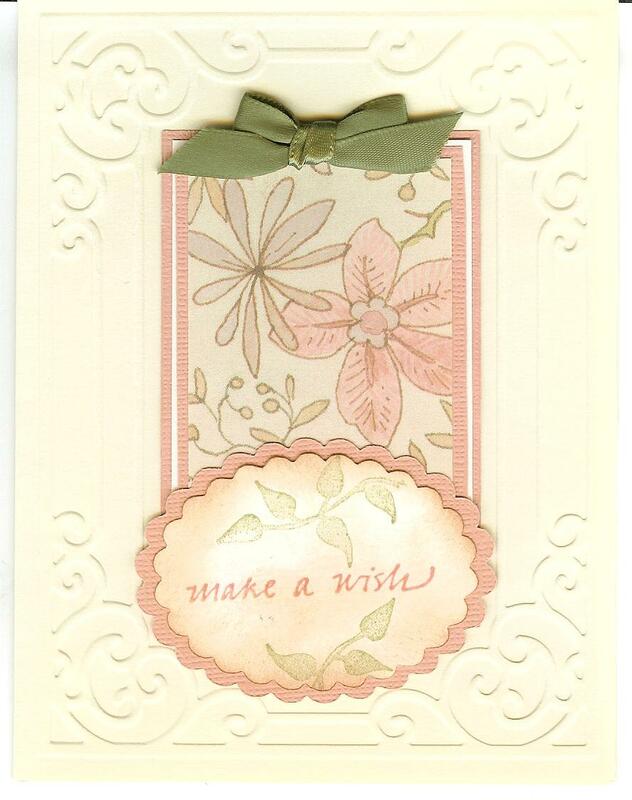 I really like the fact that she used two different embossing folders on the front of this card. Great idea Linda. Laural, you made a really cool looking card. 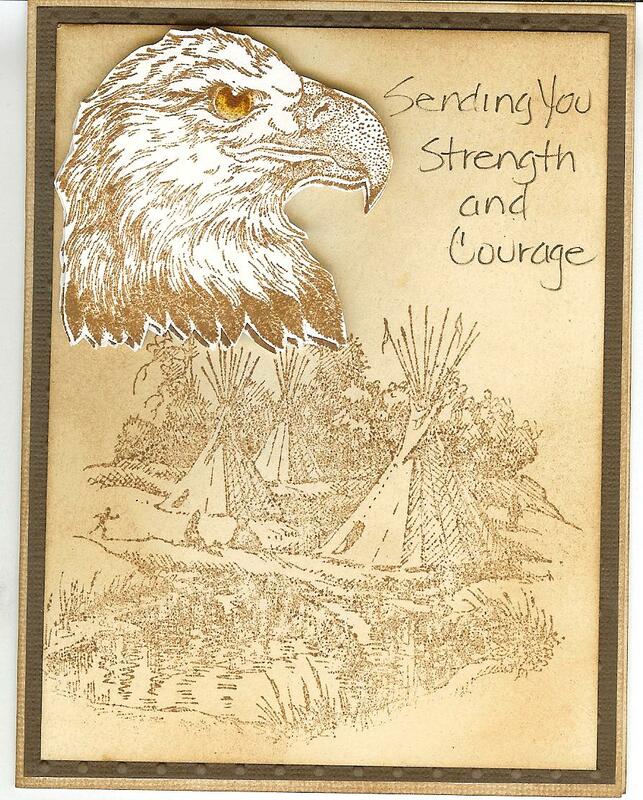 Cathy incorporated her First Nations culture in this stunning encouragement card. 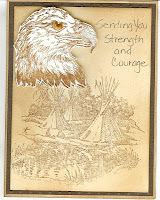 The inside of the card is stamped with a thoughtful Apache blessing stamp. Awesome card, Cathy. 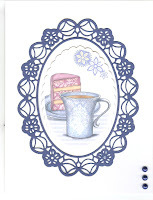 This soothing and pretty card has the coolest navy doily frame. I'm afraid this is another card that didn't have a name. You made a really nice card. 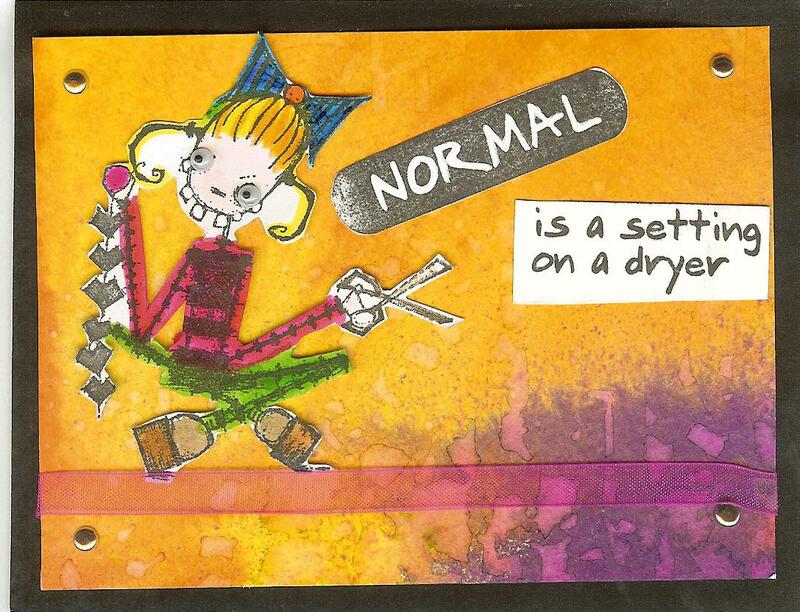 Roberta made this cute and whimsical card. 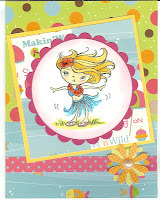 The little hula girl is super cute. 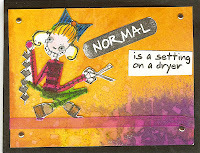 Annette made this detailed and funny card. The background is warm and mottled with many colours. Very cool technique. This card will put a smile on the face of whoever receives it. 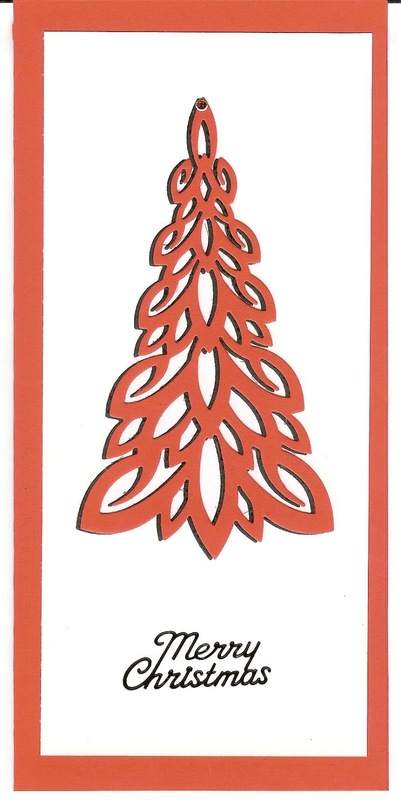 Joan also used Dee's Distinctively die to make this classy Christmas card. 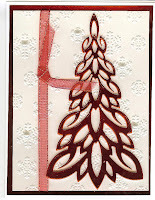 The black off-center die cut really makes this awesome tree three dimentional. Very nice Joan. 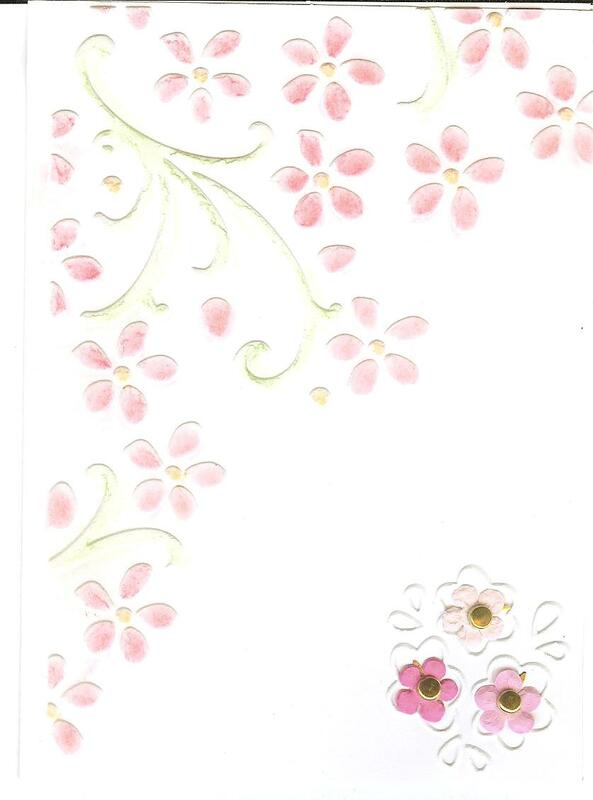 I'm afraid my scanner couldn't scan the front of Ken's cool looking sympathy card. 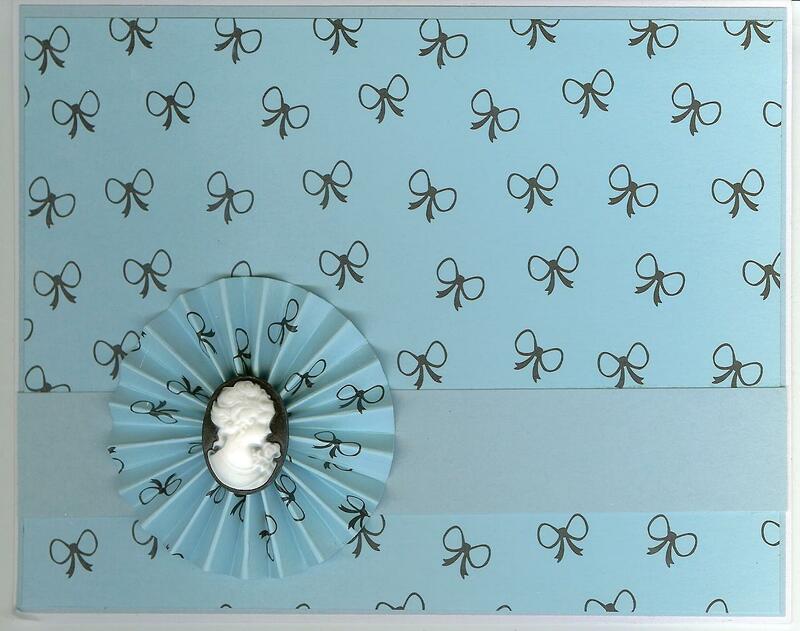 The card's background was airy with light blue and white clouds. 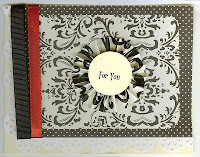 The forefront of the card is a stamped bison, embossed in white. 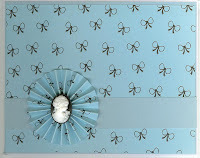 The inside of the card is also cool. 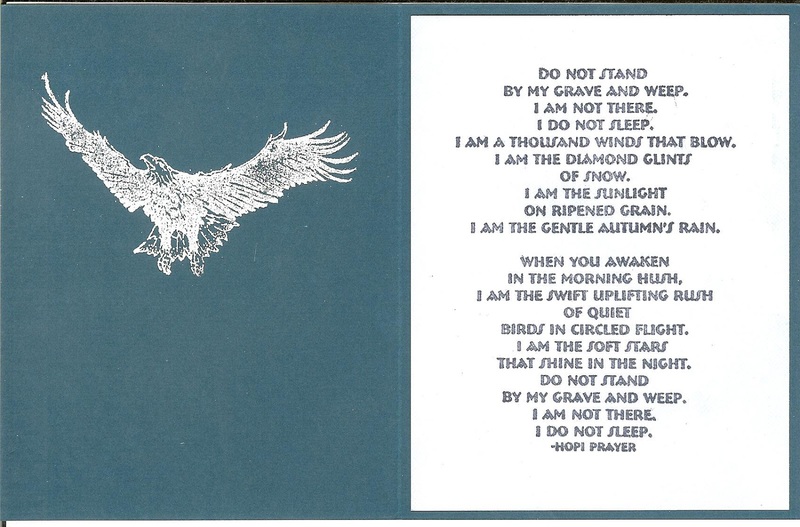 The Hopi prayer is very thoughtful. 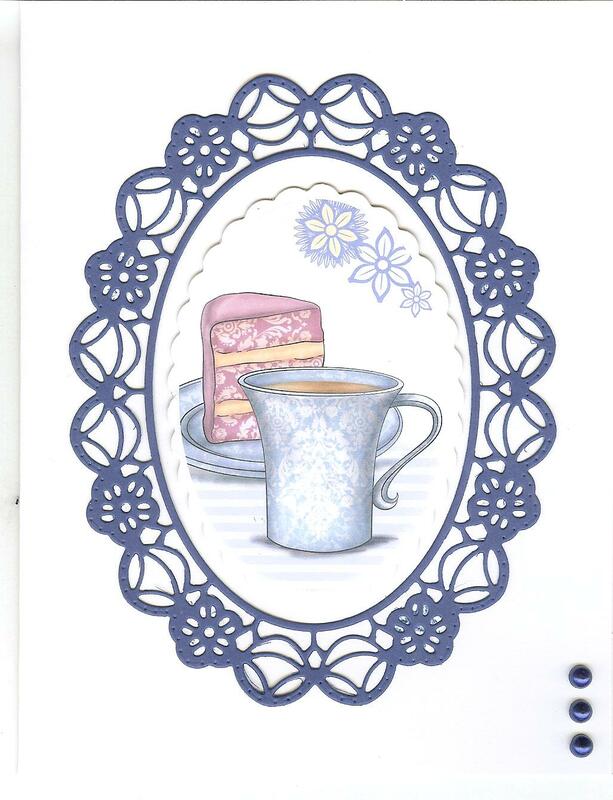 This elegant card is made by our new cardmaking friend Kay. 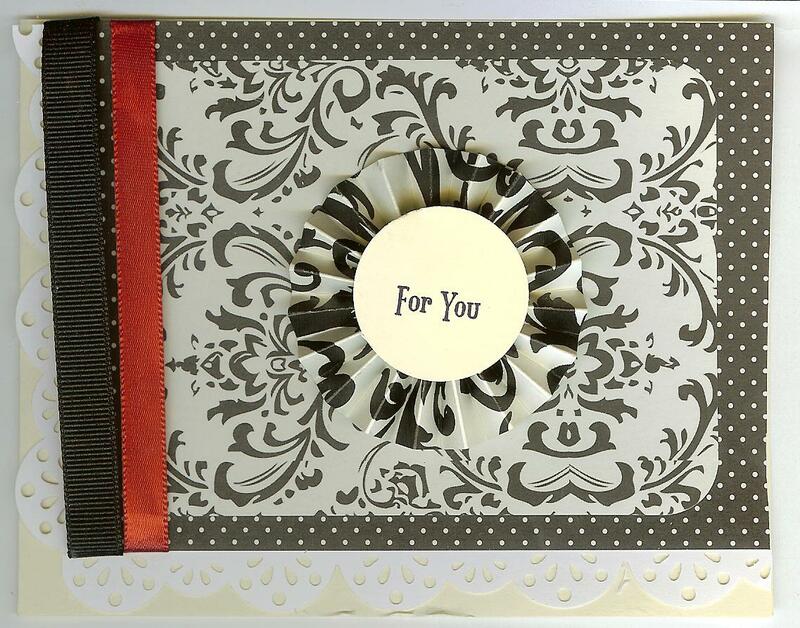 Her use of different black and white papers on the card was well designed. This is my card. 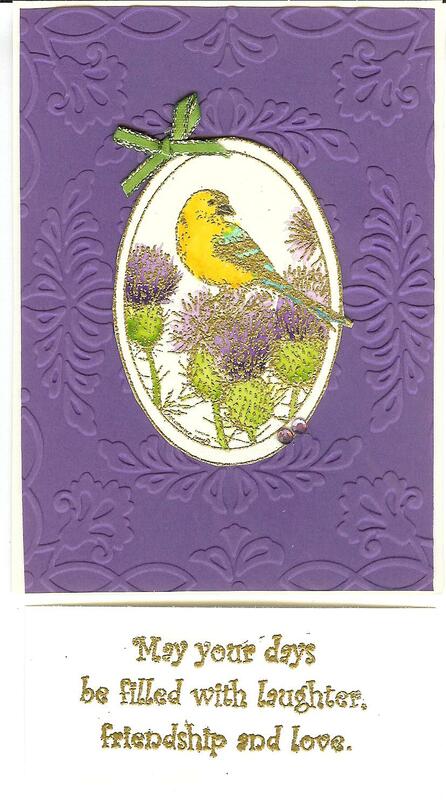 My favourite part of this card is the little butterfly which is supposed to be used in flower arrangements. 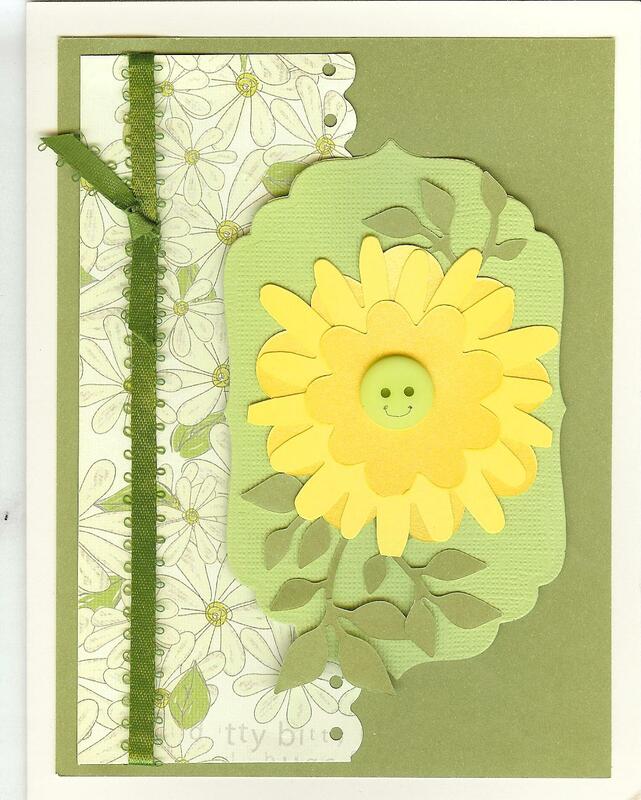 Gayle H. made this soothing and pretty card. Notice the little smile she drew on the button, in the center of the flower. What a cute idea. Last but not least, Karen made this avante-gard card with many cool elements that really work well together. Very unique Karen.